In 2009, two AgustaWestland AW139 Long Nose configuration and six Eurocopter EC135 P2+ helicopters replaced the MBB Bölkow BO-105s in service with the KLPD Dienst Luchtvaart Politie. On 21 July, the first two EC135 P2+ helicopters, PH-PXA and PH-PXB, arrived at Schiphol East and on 13 October 2009, the PH-PXZ, the first of the AW139 helicopters. On 4 January 2018, the Nationale Politie, Landelijk Eenheid, Schiphol, announced that they have ordered a third Leonardo AW139 helicopter. In April 2009, Eurocopter Deutschland started testflying the Eurocopter EC135 P2+ c/n 0795 at Donauwörth with Eurocopter Deutschland test registration D-HCBV. On 23 July 2009, the helicopter was registered PH-PXC with KLPD Dienst Luchtvaart Politie, Schiphol-Oost, the Netherlands. 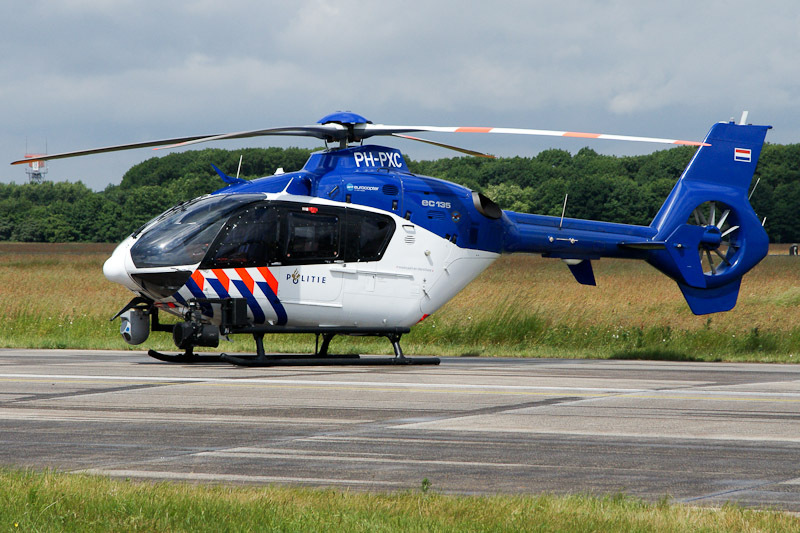 The 2009-built Eurocopter EC135 P2+ PH-PXC was delivered together with EC135 P2+ PH-PXF at Schiphol East on 25 July 2009. The KLPD Dienst Luchtvaart Politie helicopters have fixed call-signs: Eurocopter EC135 P2+ PH-PXA up-to and including PH-PXF uses Police01 up-to and including Police06. The call-signs for the AgustaWestland AW139’s are Police25 and Police26. Due to the formation of the national police in the Netherlands, the Dutch police helicopters, including EC135 P2+ PH-PXC were registered with Nationale Politie, Landelijke Eenheid, Schiphol, on 31 October 2013.